Volkswagen recommend replacement every 120,000 miles. 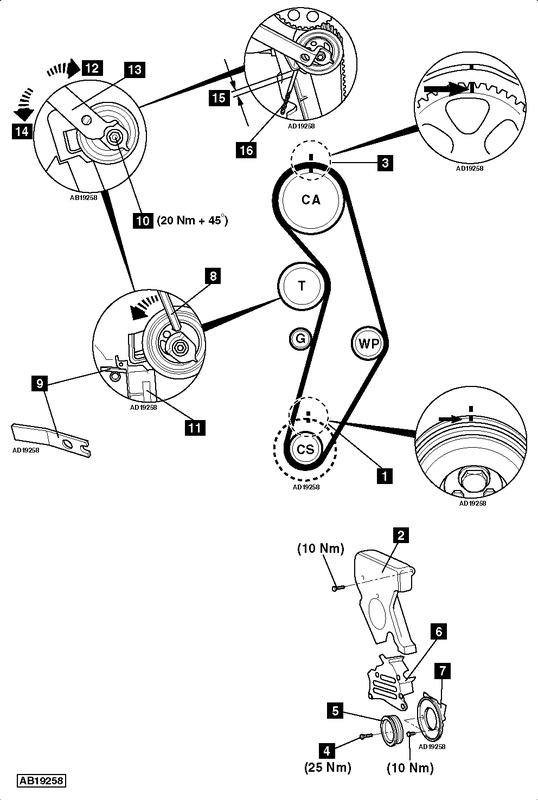 Auxiliary drive belt tensioner locking pin – No.T10060A. Tensioner locking tool – No.T10008. RH engine mounting and intermediate bracket. Fully insert Allen key into tensioner pulley  . Turn tensioner pulley slowly anti-clockwise until locking tool  can be inserted. Tool No.T10008. Ensure automatic tensioner unit locked with tool  . Fit timing belt to crankshaft sprocket.NOTE: If reusing old belt: Observe direction of rotation marks on belt. Timing belt lower cover  . Coat bolt threads with ‘D 000 600 A2’ or similar thread locking compound. Lightly tighten crankshaft pulley bolts  . Turn tensioner pulley clockwise  until just before it touches stop. Use tool No.3387  . Install automatic tensioner unit  . Turn tensioner pulley slowly anti-clockwise  until locking tool  can be removed. Use tool No.3387  . Ensure dimension  is less than 4 mm. Turn tensioner pulley slowly clockwise  until dimension  is 4±1 mm. Use drill bit  . Hold tensioner pulley in position. Use tool No.3387  . Tighten tensioner pulley nut  . Tightening torque: 20 Nm + 45°. Turn crankshaft slowly two turns clockwise to TDC on No.1 cylinder. Ensure timing marks aligned  &  . Check dimension  is 4±1 mm. Adjust position of tensioner pulley until dimension  is 4±1 mm. Use drill bit  . Ensure dimension  is 4±1 mm. Use drill bit  . Tighten crankshaft pulley bolts to 25 Nm  .NOTE: When installing timing belt centre cover, coat threads of bolts with ‘D 000 600 A2’ or similar thread locking compound.